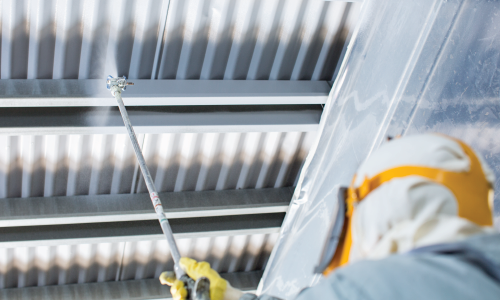 Grafotherm Anti-Condensation | Advanced Polymerics, Inc.
GrafoTherm is a one-component water-borne anti-condensation coating for steel roofing sheets, steel structures and other mineral or metal surfaces where condensation and dripping-water problems occur. 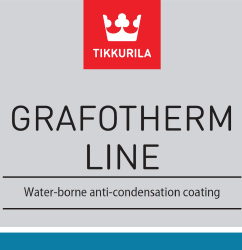 GrafoTherm is built up from millions of micropores in the sizes 0.1–100 microns. These micropores form a multi-layer, porous morphology with excellent moisture-absorption capacity. Due to the microporous structure GrafoTherm creates, evaporation occurs faster than with ordinary coatings, breaking water surface tension and spreading moisture into a microscopically thin layer. For best results, apply GrafoTherm by spraying, but it can also be effectively applied by brush or roller. Typical application areas for GrafoTherm are warehouses and parking garages, ventilation ducts, water treatment plants, production facilities, sports halls and arenas, interior surfaces of wind turbine towers, sea containers, animal sheds, indoor pools, locker-rooms and basement areas.